May — 2011 — St. Finbarr's A.C. In the summer of 2010, the inaugural series of Graded T&F Meetings took place at the UCC Mardyke Arena and CIT. The series proved very successful due in no small part to the unqualified support of the St Finbarr’s AC and its members. An average of 17 BARRS athletes attended the five summer events. We hope that those of you who competed last year will do so again in 2011 and look forward to seeing some new faces as well. 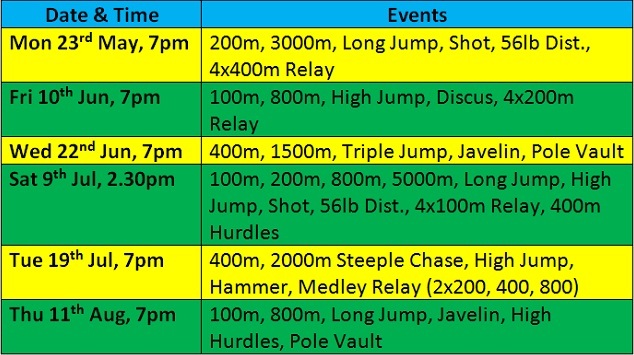 A series of six meetings is planned for Athletes male and female over 17 years on the day of the competition; the Shot, Discus, Hammer and 56lb Weights are limited to athletes over 18. Track events will, if necessary, be divided into separate races on the basis of performance, which could involve mixed races. Admission is €5 per meeting. Each athlete will receive a performance certificate and electronic timing will be used. Due to ongoing reconstruction work at the Mardyke Arena, CIT will host the 2011 series. Once again, here’s an ideal opportunity for members to compete with athletes from local clubs and ones further afield. With no Olympic Games or World Cup competition this year, these graded events should provide a welcome distraction during the height of the silly season.